Larger Project 4-7, Rear Yard » Roger Perron Inc. Partial view of the rear yard and two-story rounded spaces. The master suite is above and the family room below. The columns and railing spindles are colored precast concrete. The plaster is a faux multicolored look. The stone chimney is constructed of precast modular concrete units, and the decking is natural stone tiling. The structure is supported by a round steel frame. New home construction designed by Antonino Bruno, architect. 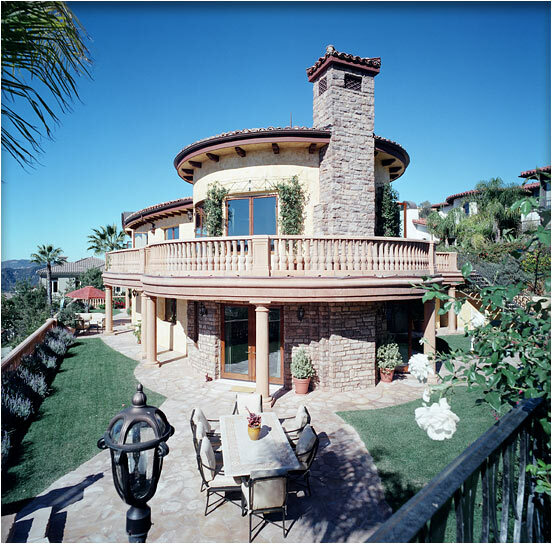 The architectural design is Tuscany, and construction took place in Pacific Palisades. A larger view of this photo can be seen on display at 3171 Los Feliz Blvd, Suite 306, Los Angeles, CA 90039. Call for an appointment at 323-664-7001.